Flight School Berlin was founded in 1998 as a TRTO (Type Rating Training Organization). Today it is an ATO (Approved Training Organisation) in accordance with EASA, which is dedicated to the education and training of airline pilots. The training is being prepared for modern flight simulators of Boeing B737 CL and NG, Airbus A300 / A310 and A320 professionally at the Lufthansa Flight Training Berlin GmbH, by experienced training captains of various airlines conducted. 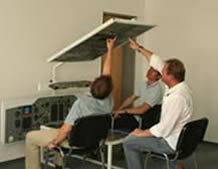 The Flight School Berlin using also the simulator training centers in Prague and Amsterdam. Meanwhile, we can call it a good recognized name in Europe our own. This is evidenced by, among other things, an increasing number of students of different nationalities. Often we arranged through our connections established over the years many of our graduates after training directly to an airline.